Egg White Powder provides an excellent source of protein. 4 Tbsp = 24 grams of protein. 100 grams of Egg White Powder equals 70 grams of Protein. There are approximately 4 tablespoons in 30 grams. 100 gm of Egg White Powder dissolved in 700 gm of water is equivalent to about 800 gm of fresh liquid egg white. That’s about 20 eggs’ worth of whites in about 7 tbsps of egg white powder! No matter what your day looks like, Egg White Powder is a truly excellent source of protein to keep you fueled and ready for whatever’s in store. 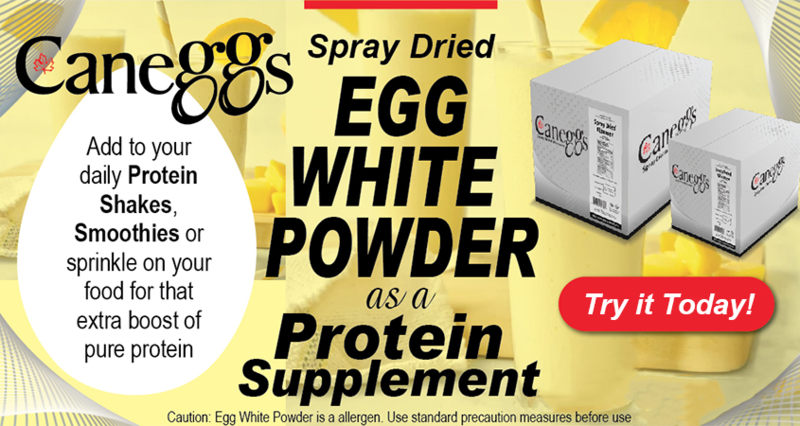 Add our powdered egg whites to your daily protein shake or smoothie for that extra boost! The fresh Canadian eggs used in the making of our powdered egg whites are free of steroids, hormones, and antibiotics. Our product is lactose-free, making it an ideal supplement for individuals who are lactose intolerant. It is free of cholesterol and low in fat, making it a healthy option for those looking to lose weight or reduce cholesterol in their diet. This is an ingredient rather than a ready supplement. * Please consult your physician and/or personal trainer for personalized information on your daily requirements.